Marina Lambrini Diamandis (born 10 October 1985), known mononymously as Marina (previously Marina and the Diamonds), is a Welsh singer and songwriter. Diamandis has described herself as an "indie artist with pop goals." Born in Brynmawr and raised in nearby Pandy, she moved to London as a teenager to become a professional singer, despite having little formal musical experience. In 2009, Diamandis came to prominence upon placing second in the BBC's Sound of 2010. Her debut studio album, The Family Jewels (2010), incorporates indie pop and new wave musical styles. It entered the UK Albums Chart at number five and was certified gold by the British Phonographic Industry. The album's second single, "Hollywood", peaked at number 12 on the UK Singles Chart. Her follow-up record Electra Heart (2012) is a concept album about a character of the same name. It integrates elements of electropop, and its producers include StarGate, Dr. Luke, and Diplo. It became her first number-one project in the UK, where it was also certified gold, and its lead single "Primadonna" is her highest-charting track in the UK Singles Chart, reaching number 11. Diamandis describes Electra Heart as "tongue-in-cheek" and considers it to have been better received in the United States, while some British fans disliked the change in musical direction. 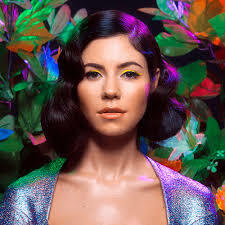 Diamandis's synthpop-inspired third studio album Froot (2015) became her third top-ten album in the UK, and her first top-ten entry on the US Billboard 200, where it charted at number 8. Produced entirely by Diamandis and David Kosten, it was praised for its cohesive sound and introspective lyrical content.